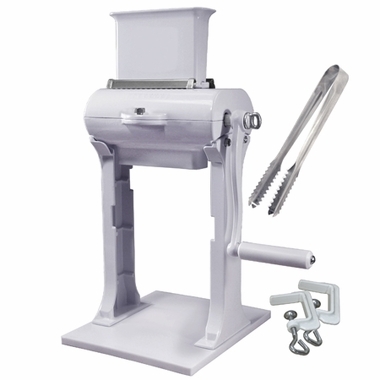 Throat opening is 5-1/4" long by 1-3/8"
Weston Meat Tenderizer weak link. Shipped and received on time. Product was easy to assemble and appeared to be as advertised. After cleaning the tenderizer I ran some 1/2&quot; sliced tenderloin through. Handle broke where the swivel handle attaches on first piece of meat.. Appears to be cast aluminum, needs to be something heavier obviously. Operated the product with the broken handle and tenderized the meat well but now unfortunately I will have to find out how well they stand behind their product. Crank handle needs to be of much more durable construction. Merchant's comment:Sorry to hear about the handle. Weston does a great job with warranty needs. If you run into any resistance please let us know and we will help any way we can.